Kris Commons capped an outstanding performance with the winning goal as Derby inflicted the first opening-day defeat on Leeds since 1989 after a feisty and exciting contest at Elland Road. The match marked Leeds' return to the Championship but Simon Grayson's team struggled to neutralise the attacking threat posed by Derby and their 4-2-3-1 formation. The Rams trio of Commons, Paul Green and Tomasz Cywka were extremely effective playing behind Rob Hulse - and all too often found plenty of space in dangerous midfield positions. Commons was the outstanding performer, and it was his pass that led to Hulse's opener, while the 26-year-old struck from the penalty spot after Luciano Becchio had equalised for Leeds following a mistake from Robbie Savage, with all the goals coming in the opening half. Derby only won three away games in the Championship last season - and might have had to settle for a draw here but for a late goalline clearance by Gareth Roberts from a Neill Collins header as the home team finished strongly. Having said that, Nigel Clough's team could have avoided a nervous finish to the match but they were repeatedly denied by a series of outstanding saves from Kasper Schmeichel on his Leeds debut. Schmeichel was one of five players in the Leeds line-up who joined the club permanently in the summer. He was quickly into the action after the superlative Commons ran from deep before unleashing an 18-yard left-foot strike that appeared to have the keeper beaten but flew inches over the Leeds goal. Leeds enjoyed a brief spell in the ascendancy, with Collins, signed permanently from Preston after a loan spell last season, heading over after a brilliant cross from Jonathan Howson. But it was the Rams who struck first, Green dispossessing Howson in midfield before bearing down on goal and playing a wonderfully weighted pass that Hulse, recently linked with a move away from Derby, smashed beyond Schmeichel with a right-foot strike. Grayson's team responded within minutes, helped in part by some awful Derby defending. The visiting side dallied at the back and when Savage's unfortunate touch gifted possession to Howson, the Leeds midfielder atoned for his earlier error by playing a square ball that the unmarked Becchio slotted home. The attacking play continued to comfortably eclipse the standard of defending, as a deft flick from Richard Naylor struck the Rams crossbar, while another sumptuous Commons pass played Cywka through for the incident that led to Derby's penalty. Lloyd Sam, signed from Charlton during the close season, attempted to tackle Cywka, although even with the assistance of replays it was difficult to tell whether he actually made contact with the ball. Commons converted the spot-kick with a deft touch which made the ball roll slowly along the ground and into the net after Schmeichel had committed himself. Collins went close again for Leeds with a header, while Leeds' failure to pick up runs from deep saw Commons find Green in an excellent position only for the 27-year-old to shoot straight at Schmeichel. There seemed to be no limit to the havoc Commons could cause and shortly before the break he ghosted into the area before guiding a Savage free-kick towards goal, only for Schmeichel to make an excellent reaction stop. The sun gave way to rain after the break and, if anything, the match became even more competitive as Stephen Bywater saved from Bradley Johnson, while Leeds were once again indebted to Schmeichel after he made a superb smothering save to deny Green from six yards. However, as the contest passed the hour mark the pace noticeably dropped - and with it the incidence of clear openings. Even so, there were further opportunities for Schmeichel to quickly underline his worth at his new club, the Dane making a brilliant double save to deny Hulse and then Rams substitute Shaun Barker. 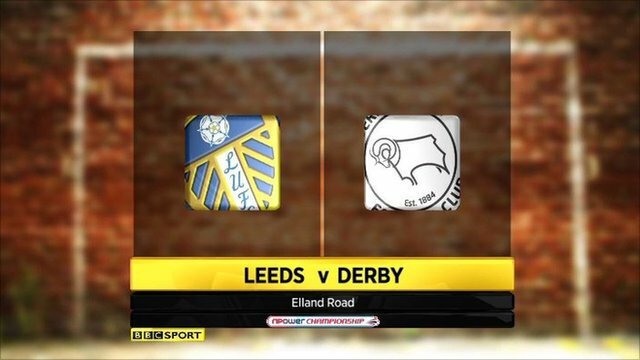 Leeds dominated the final minutes but were let down by some poor decision making at crucial times as Derby held on for all three points. 94:09 The ref blows the whistle to begin the match. 90:00+3:56 Attacking throw-in by Paul Connolly (Leeds). 90:00+3:21 Attacking throw-in by Gareth Roberts (Derby). 90:00+3:14 Attacking throw-in by Paul Connolly (Leeds). 90:00+2:34 Mike Grella sends in a cross, clearance made by Robbie Savage. 90:00+2:19 Attacking throw-in by Paul Connolly (Leeds). 90:00+1:03 John Brayford concedes a free kick for a foul on Aidan White. Free kick crossed right-footed by Mike Grella from left wing. 90:00+0:29 Shot by Mike Grella. Gareth Roberts gets a block in. 90:00+0:04 Defending throw-in by John Brayford (Derby). 90:00 The match has reached full-time. 89:31 Goal kick taken long by Stephen Bywater (Derby). 89:15 Bradley Johnson crosses the ball, Sanchez Watt produces a header from inside the area that goes over the bar. 89:07 Attacking throw-in by Aidan White (Leeds). 88:11 Luciano Becchio gives away a free kick for an unfair challenge on Dean Leacock. Dean Leacock takes the direct free kick. 87:28 Robbie Savage fouled by Bradley Johnson, the ref awards a free kick. Free kick taken by Gareth Roberts. 87:02 Attacking throw-in by Sanchez Watt (Leeds). 85:05 The ball is sent over by Robbie Savage, Rob Hulse takes a shot. Comfortable save by Kasper Schmeichel. 85:05 Substitution Mike Grella on for Jonathan Howson. 85:05 Booking Paul Connolly goes into the referee's book. 84:48 Paul Connolly gives away a free kick for an unfair challenge on Ben Pringle. 84:15 Attacking throw-in by Federico Bessone (Leeds). 83:47 The assistant referee flags for offside against Rob Hulse. Indirect free kick taken by Kasper Schmeichel. 83:09 Substitution Kris Commons goes off and Chris Porter comes on. 81:39 The assistant referee signals for offside against Luciano Becchio. Stephen Bywater restarts play with the free kick. 81:19 Attacking throw-in by Federico Bessone (Leeds). 79:53 Foul by Shaun Barker on Luciano Becchio, free kick awarded. Bradley Johnson produces a shot on goal direct from the free kick, blocked by Shaun Barker. Inswinging corner taken from the left by-line by Jonathan Howson, Gareth Roberts makes a clearance. 79:16 Attacking throw-in by Federico Bessone (Leeds). 78:58 Attacking throw-in by Federico Bessone (Leeds). 78:24 Defending throw-in by Gareth Roberts (Derby). 77:16 Kris Commons has an effort direct from the free kick. 77:16 Booking Jonathan Howson goes into the book. 77:06 Unfair challenge on Paul Green by Jonathan Howson results in a free kick. 76:50 Attacking throw-in by Federico Bessone (Leeds). 76:26 Substitution Neil Kilkenny leaves the field to be replaced by Adam Clayton. 76:03 Attacking throw-in by Gareth Roberts (Derby). 75:46 Attacking throw-in by Gareth Roberts (Derby). 75:07 Attacking throw-in by John Brayford (Derby). 74:39 Shot by Shaun Barker (Derby) right-footed from right side of penalty area (6 yards), save (parried) by Kasper Schmeichel (Leeds). Correction - 74:39 Shaun Barker takes a shot. Save by Kasper Schmeichel. 74:21 Rob Hulse takes a shot. Save by Kasper Schmeichel. 73:48 Neil Kilkenny challenges Paul Green unfairly and gives away a free kick. Robbie Savage takes the direct free kick. 73:26 Defending throw-in by Gareth Roberts (Derby). 73:04 Substitution Ben Pringle on for Tomasz Cywka. 72:21 The ball is delivered by Neil Kilkenny, Header from deep inside the penalty area by Richard Naylor goes harmlessly over the crossbar. 71:54 Outswinging corner taken from the right by-line by Neil Kilkenny. 70:57 Gareth Roberts crosses the ball in from the free kick. 70:57 Booking The referee cautions Rob Hulse for unsporting behaviour. 70:29 Paul Connolly concedes a free kick for a foul on Rob Hulse. 70:10 Defending throw-in by Gareth Roberts (Derby). 69:49 Aidan White crosses the ball. 69:33 Defending throw-in by John Brayford (Derby). 69:04 Substitution Aidan White joins the action as a substitute, replacing Lloyd Sam. 68:34 Outswinging corner taken by Neil Kilkenny from the right by-line. 67:26 Defending throw-in by Gareth Roberts (Derby). 66:55 Goal kick taken long by Stephen Bywater (Derby). 66:44 Bradley Johnson produces a left-footed shot from just outside the area that goes wide left of the goal. 65:25 Corner taken left-footed by Kris Commons from the right by-line, clearance made by Richard Naylor. 64:43 Unfair challenge on Dean Leacock by Bradley Johnson results in a free kick. Direct free kick taken by Dean Leacock. 64:00 Defending throw-in by John Brayford (Derby). Correction - 63:39 Neil Kilkenny has a curled shot. Fantastic save by Stephen Bywater. 63:39 Shot by Neil Kilkenny (Leeds) curled right-footed from left channel (18 yards), save (punched) by Stephen Bywater (Derby). 63:12 Attacking throw-in by Paul Connolly (Leeds). 61:55 Inswinging corner taken left-footed by Kris Commons, save by Kasper Schmeichel. 61:12 Attacking throw-in by Sanchez Watt (Leeds). 60:57 Unfair challenge on Rob Hulse by Richard Naylor results in a free kick. James Bailey restarts play with the free kick. 60:18 Direct free kick taken by Gareth Roberts. 60:18 Booking Richard Naylor is shown a yellow card for unsporting behaviour. 60:04 Free kick awarded for a foul by Richard Naylor on Rob Hulse. 58:55 Attacking throw-in by Federico Bessone (Leeds). 58:29 Attacking throw-in by Federico Bessone (Leeds). 58:03 Goal kick taken long by Kasper Schmeichel (Leeds). Attacking throw-in by Federico Bessone (Leeds). 57:29 Effort on goal by Rob Hulse from just inside the penalty area goes harmlessly over the target. 56:30 Gareth Roberts delivers the ball, Paul Connolly manages to make a clearance. Inswinging corner taken by Tomasz Cywka from the left by-line played to the near post, Federico Bessone makes a clearance. 55:58 Lloyd Sam delivers the ball. 55:26 Goal kick taken long by Kasper Schmeichel (Leeds). 55:14 Kris Commons produces a cross. 54:53 Kris Commons decides to take a short corner. 54:48 The ball is crossed by Tomasz Cywka, Paul Connolly makes a clearance. 54:10 Lloyd Sam delivers the ball, clearance made by Shaun Barker. 53:44 Attacking throw-in by Federico Bessone (Leeds). 53:15 Defending throw-in by Federico Bessone (Leeds). 52:29 Centre by Jonathan Howson. 52:02 Corner from right by-line taken by Neil Kilkenny. 51:45 Bradley Johnson takes the chance to get an effort at goal. Save by Stephen Bywater. 51:25 Defending throw-in by Federico Bessone (Leeds). 51:06 Defending throw-in by Paul Connolly (Leeds). 50:45 Luciano Becchio gives away a free kick for an unfair challenge on Shaun Barker. Free kick taken by John Brayford. 48:50 Shot comes in from Bradley Johnson from the free kick. 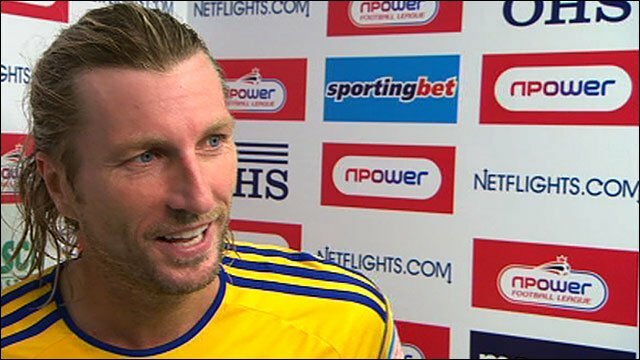 48:50 Booking Robbie Savage is cautioned. 48:24 Free kick awarded for a foul by Robbie Savage on Federico Bessone. 48:10 Attacking throw-in by Paul Connolly (Leeds). 46:48 Free kick awarded for a foul by Rob Hulse on Bradley Johnson. Federico Bessone restarts play with the free kick. 46:10 Defending throw-in by Federico Bessone (Leeds). 45:19 Defending throw-in by Paul Connolly (Leeds). Correction - 45:01 Substitution Shaun Barker comes on in place of Russell Anderson. 45:01 Substitution Derby substitution: Russell Anderson replaced by Shaun Barker (tactical). 45:00+1:55 Unfair challenge on Luciano Becchio by Russell Anderson results in a free kick. The free kick is delivered right-footed by Neil Kilkenny from right channel, save made by Stephen Bywater. 45:00+1:10 Defending throw-in by Paul Connolly (Leeds). 45:00+0:43 Goal kick taken long by Stephen Bywater (Derby). 45:00+0:38 Bradley Johnson crosses the ball. 45:00+0:16 Shot by Lloyd Sam. James Bailey gets a block in. 43:39 Free kick awarded for a foul by Sanchez Watt on Kris Commons. The ball is swung over by Robbie Savage, Effort from inside the area by Rob Hulse misses to the left of the goal. Inswinging corner taken from the right by-line by Tomasz Cywka. 43:16 Free kick awarded for a foul by Neill Collins on Rob Hulse. Free kick taken by Robbie Savage. 42:59 Bradley Johnson has an effort at goal from outside the box which goes wide right of the goal. 42:06 Inswinging corner taken right-footed by Tomasz Cywka. 41:47 Tomasz Cywka takes a shot. Richard Naylor gets a block in. 40:16 Luciano Becchio is flagged offside by the assistant referee. Free kick taken by Stephen Bywater. 39:53 James Bailey sends in a cross. 39:31 Attacking throw-in by Gareth Roberts (Derby). 37:25 Defending throw-in by Federico Bessone (Leeds). 36:59 Defending throw-in by Gareth Roberts (Derby). 36:11 Inswinging corner taken by Neil Kilkenny, clearance by James Bailey. 36:06 Centre by Sanchez Watt, Russell Anderson makes a clearance. 35:34 Paul Green takes a shot. Kasper Schmeichel makes a save. 34:35 Attacking throw-in by Gareth Roberts (Derby). 33:12 Attacking throw-in by Paul Green (Derby). Correction - 33:12 Attacking throw-in by Gareth Roberts (Derby). 32:39 Richard Naylor fouled by Dean Leacock, the ref awards a free kick. Bradley Johnson takes the free kick. 32:29 Goal kick taken long by Stephen Bywater (Derby). 31:20 Unfair challenge on Lloyd Sam by John Brayford results in a free kick. The ball is sent over by Neil Kilkenny, Bradley Johnson takes a shot. 30:55 Goal kick taken long by Kasper Schmeichel (Leeds). 30:43 James Bailey has an effort at goal from outside the penalty box missing to the wide right of the goal. 29:59 Attacking throw-in by Gareth Roberts (Derby). 29:27 Attacking throw-in by Paul Connolly (Leeds). 29:08 Attacking throw-in by Paul Connolly (Leeds). 28:29 Goal kick taken long by Stephen Bywater (Derby). 28:01 Rob Hulse challenges Neill Collins unfairly and gives away a free kick. Neil Kilkenny takes the free kick. 27:32 Attacking throw-in by Federico Bessone (Leeds). 26:17 GOAL - Kris Commons:Leeds United 1 - 2 Derby Kris Commons scores a placed penalty. Leeds 1-2 Derby. 25:24 Lloyd Sam gives away a Penalty for an unfair challenge on Tomasz Cywka. 24:40 Defending throw-in by Federico Bessone (Leeds). 23:49 Defending throw-in by Gareth Roberts (Derby). 23:22 Attacking throw-in by Paul Connolly (Leeds). 23:08 Defending throw-in by Gareth Roberts (Derby). 22:40 Shot by Richard Naylor from 6 yards. 22:03 James Bailey challenges Sanchez Watt unfairly and gives away a free kick. The free kick is swung in right-footed by Neil Kilkenny. 21:31 Attacking throw-in by Gareth Roberts (Derby). 19:56 Paul Connolly challenges Dean Leacock unfairly and gives away a free kick. The free kick is delivered right-footed by Robbie Savage from left wing, Bradley Johnson manages to make a clearance. Corner taken by Kris Commons from the right by-line, save by Kasper Schmeichel. 19:51 Attacking throw-in by Gareth Roberts (Derby). 19:18 Goal kick taken short by Stephen Bywater (Derby). 19:04 The ball is sent over by Gareth Roberts, comfortable save by Kasper Schmeichel. 18:28 Attacking throw-in by Gareth Roberts (Derby). 18:13 Attacking throw-in by Gareth Roberts (Derby). 17:55 Attacking throw-in by Gareth Roberts (Derby). 17:31 A cross is delivered by Neil Kilkenny. 17:13 Bradley Johnson produces a cross. 16:45 The referee blows for offside. Free kick taken by Stephen Bywater. 16:21 Attacking throw-in by Paul Connolly (Leeds). 15:01 Assist by Jonathan Howson. 15:01 GOAL - Luciano Becchio:Leeds United 1 - 1 Derby Luciano Becchio gets on the score sheet with a goal from close in low into the middle of the goal. Leeds 1-1 Derby. 14:43 Luciano Becchio is caught offside. Stephen Bywater takes the free kick. 14:13 Defending throw-in by Neill Collins (Leeds). 14:01 Goal kick taken long by Stephen Bywater (Derby). 12:09 Assist by Paul Green. 12:09 GOAL - Rob Hulse:Leeds United 0 - 1 Derby A goal is scored by Rob Hulse from inside the box high into the middle of the goal. Leeds 0-1 Derby. 11:35 Defending throw-in by John Brayford (Derby). 11:15 Goal kick taken long by Kasper Schmeichel (Leeds). 11:04 Kris Commons produces a right-footed shot from just outside the area that goes wide left of the goal. 10:49 Attacking throw-in by Gareth Roberts (Derby). 10:42 Defending throw-in by Paul Connolly (Leeds). 10:37 Centre by Paul Green. 10:20 Attacking throw-in by Robbie Savage (Derby). 9:25 Goal kick taken long by Kasper Schmeichel (Leeds). 9:21 Attacking throw-in by Gareth Roberts (Derby). 8:35 Goal kick taken short by Stephen Bywater (Derby). 8:15 Neil Kilkenny produces a cross, Headed effort from inside the area by Neill Collins misses to the left of the goal. 7:22 Outswinging corner taken from the right by-line by Neil Kilkenny, Neill Collins takes a shot. Save by Stephen Bywater. 6:22 The referee blows for offside against Luciano Becchio. Stephen Bywater takes the free kick. 5:53 Defending throw-in by Gareth Roberts (Derby). 5:44 Defending throw-in by Gareth Roberts (Derby). 5:26 Goal kick taken short by Stephen Bywater (Derby). 5:12 Bradley Johnson has an effort from just inside the box that misses to the left of the target. 4:28 Defending throw-in by Gareth Roberts (Derby). 3:50 Sanchez Watt concedes a free kick for a foul on Paul Green. Free kick taken by Robbie Savage. 3:36 Attacking throw-in by Paul Connolly (Leeds). 3:06 Goal kick taken long by Stephen Bywater (Derby). Correction - 3:06 Goal kick taken short by Stephen Bywater (Derby). 2:40 Attacking throw-in by Paul Connolly (Leeds). 2:27 Attacking throw-in by Paul Connolly (Leeds). Correction - 2:06 Goal kick taken short by Stephen Bywater (Derby). 2:06 Goal kick taken long by Stephen Bywater (Derby). 1:48 Attacking throw-in by Paul Connolly (Leeds). 1:43 Centre by Paul Connolly, clearance by Dean Leacock. 1:02 Kris Commons takes a shot from just outside the penalty area which clears the crossbar. 0:14 Defending throw-in by Federico Bessone (Leeds).